To facilitate an export-led recovery, this trend [decreasing competitiveness] has to be corrected and there is no way this can be achieved in the short run other than by adjusting prices and costs. I know the difficulties that such adjustment creates and the criticisms that are leveled against it. But we are in a monetary union and this is how adjustment works. Sharing a currency brings considerable microeconomic benefits but it requires that relative prices can adjust to offset shocks. The troika requests for a reduction in costs have been met by Greeks, as our first chart shows. Indeed, nominal wages(1) have fallen by 23 percent from their peak in the first quarter of 2010, and real wages(2) have fallen by 27.8 percent over the same period. While it is true that prices started to fall later than wages, and therefore the improvement in competitiveness has been limited, its impact on exports is doubtful. 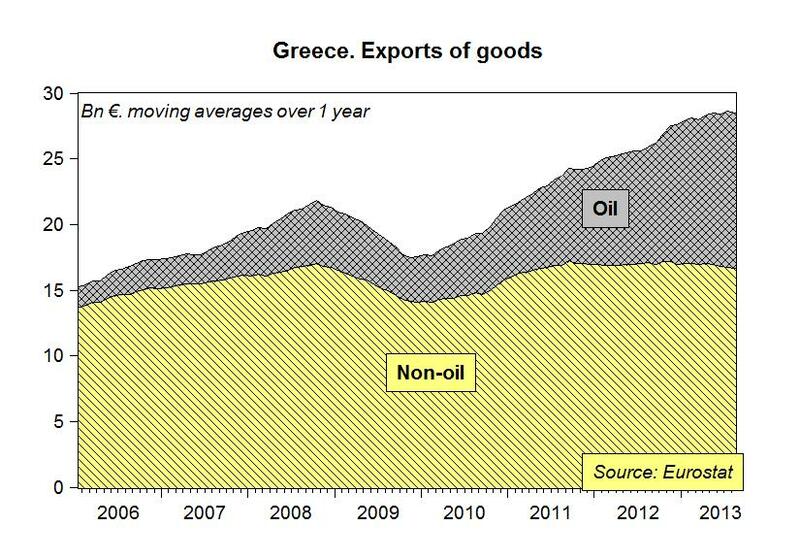 The chart above shows that nominal exports of goods have somewhat improved, but if we decompose exports of goods using the Eurostat database by SITC categories, we learn that most – if not all – of the increase in exports of goods is related to oil products(3). Indeed, recent news indicates a fall in non-oil exports. 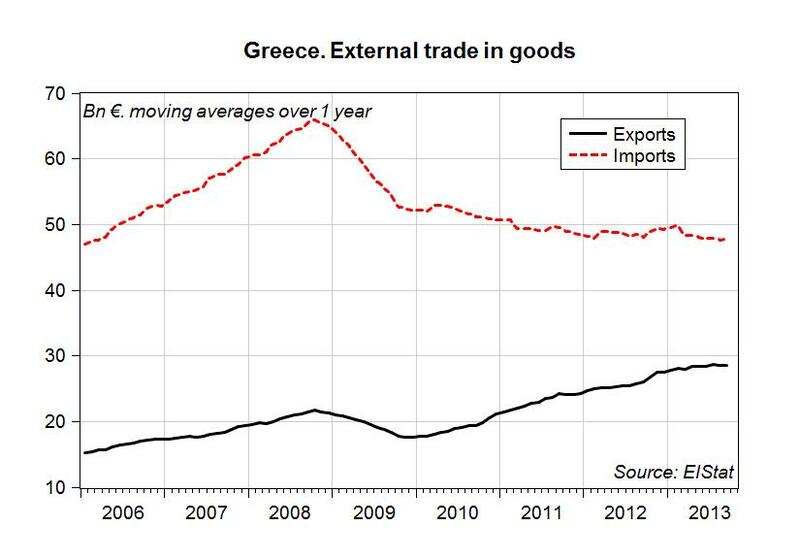 Summing up, internal devaluation has so far had negligible effects on Greek exports, while the fall in the purchasing power of wages has added to the fall in domestic demand generated by fiscal austerity, and thereby contributed to the unprecedented crisis in Greece. Our July projections have so far been on track, and we predict that even if prices keep falling, as advocated by the troika plan, the response of the current account will be too slow to compensate for fiscal austerity. Strategies to increase employment and income are urgently needed. 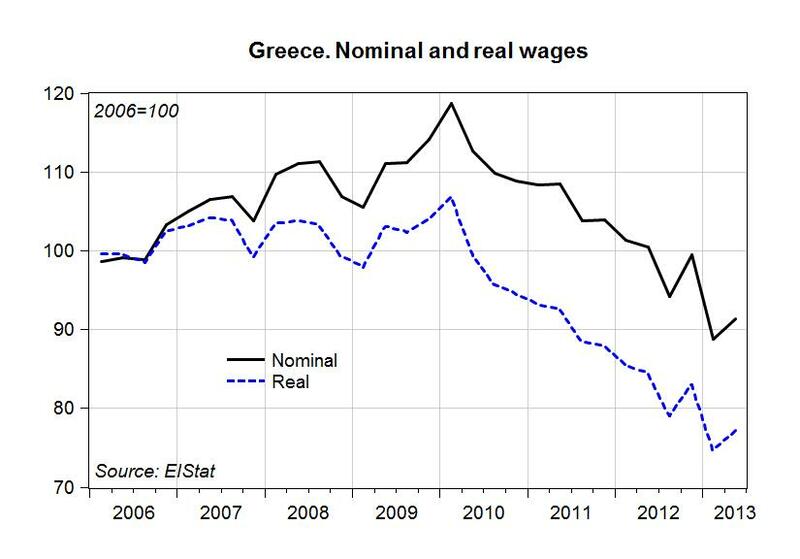 (1) The wage index is taken from the Hellenic Statistical Authority (ElStat). (2) Real wages are obtained by deflating the wage index by the Overall CPI published by ElStat, seasonally adjusted in Eviews and converted to quarterly frequency. (3) We use the SITC category “Mineral fuels, lubricants and related materials” for our measure of oil-related exports. Is an R&D-Led Export Strategy Our Best Shot? The U.S. needs an export strategy led by research and development, and it needs it now. A serious federal commitment to R&D would help arrest the long-term decline in manufacturing, and return America to its preeminent and competitive positions in high tech. At the same time, increasing sales of these once-key exports abroad would improve our also-declining balance of trade. It’s the best shot the U.S. has to energize its weak economic recovery. R&D investment in products sold in foreign markets would yield a greater contribution to economic growth than any other feasible approach today. It would raise GDP, lower unemployment, and rehabilitate production operations in ways that would reverberate worldwide. For our R&D/export model, we posited a modest infusion of $160 billion per year — about 1 percent of GDP — until 2016. We saw unemployment fall to less than 5 percent by 2016, compared with CBO forecasts that unemployment will remain over 7 percent. Real GDP growth — instead of hovering around 3.5 percent, by CBO estimates, on the current path — gradually rose to near 5.5 percent by the end of the period. Applications to the Summer Seminar may be made to Susan Howard at the Levy Institute (howard@levy.org) and should include a current curriculum vitae. Admission to the Seminar includes provision of room and board on the Bard College campus. A limited number of small travel reimbursements of $100 for US fellows and $300 for foreign fellows, respectively, are available to participants. Due to limited space availability, the deadline for applications is March 1, 2014. To get a sense of the range of topics and speakers, here is a look at last year’s schedule, which included a closing lecture by Paul McCulley. In “America’s misplaced lecture to Germany,” Gideon Rachman ends up offering a singularly misplaced defense of Germany. Quite similar to the typical stories one hears on this matter in Germany itself, Rachman appears to be unaware of how self-contradictory his arguments really are. To begin with, after describing the Federal Reserve’s QE policies as both a vital support to the world economy and an addictive drug, he goes on to identify the markets’ reaction to tapering by the Fed as the “biggest threat to the global economy in the coming year.” Does he suggest here that, once adopted, QE policies can never be reversed without causing market turbulences and that QE policies, therefore, should never have been adopted in the first place? That would beg the question as to what else would have provided that vital support to the world economy which Rachman himself attributes to these very policies. The real issue here is why such overburdening responsibility for supporting the global economy has come to rest on the Federal Reserve’s shoulders. Apparently without seeing the connection, Rachman supplies one reason himself: the “particularly mindless game” of toying with defaulting on the national debt on the part of the US Congress that has accompanied harsh fiscal contraction in the US this year. Another reason is to be seen in the fact that Europe’s economy, especially the eurozone under German austerity leadership, has been shrinking for years. Europe is still the US’s most important trading partner. It may be a matter of annoyance rather than envy that US firms find themselves exporting into a shrinking market while German firms enjoy participating in the recovery of their important US market. Globally, then, QE may also be seen as a defense against bloated German export surpluses, benefiting from a euro exchange rate that is way undervalued as far as Germany is concerned. In advance of this week’s Ford–Levy Institute conference in Athens, Greece (Nov. 8–9), Jörg Bibow gave an interview with George Papageorgiou, senior editor of newmoney.gr, on the role German policy has played (and still plays) in generating and exacerbating many of the problems plaguing the eurozone periphery — something Bibow was warning about back in 2005 (see here, for instance). He also addressed where the eurozone needs to go from here, touching on a plan for a Euro Treasury he’ll be discussing at the Athens conference. You have been critical of German policy. How does it really affect the rest of Europe? In what ways does it cause harm to the peripheral economies? Yes, indeed, German policy bears foremost responsibility for the euro crises and German policy is key to Europe’s future. Germany is Europe’s largest economy. For that reason alone whatever happens in Germany inevitably significantly impacts the eurozone economy. For instance, when Germany prescribed itself an extra dose of wage repression and fiscal austerity in the early 2000s, this had rather fateful consequences for the currency union. For one thing, stagnant domestic demand in Germany constrained its euro partners’ exports to Germany. For another, stagnation in Germany provoked some degree of monetary easing from the ECB, monetary easing which was both too little for Germany but too much for the euro periphery where wages and domestic demand were thereby propelled further. In other words, Germany undermined the ECB’s “one-size-fits-all” monetary policy stance. This happened alongside cumulative divergences in intra-area competitiveness positions, current account imbalances and the corresponding buildup in foreign asset and debt positions. Together this meant that the currency union was going to face trouble as soon as those imbalances would start to unravel. I started warning of these developments in 2005, but the euro authorities were sleeping at the wheel for many years to come. This is the background to the still unresolved euro crisis, which is primarily a balance-of-payments and banking crisis that only became a sovereign debt crisis as a consequence. Adding insult to injury, the crisis has left Germany in the driver’s seat in eurozone policymaking. Germany punches above its weight in current policy debates. Unfortunately, in misdiagnosing the true nature of the crisis, Germany’s policy prescriptions have focused on nothing but fiscal austerity and structural reform. The consequences are proving a disaster for Europe. In particular, since Germany refuses to adjust its massive external imbalance and continues to have very low inflation, the ongoing rebalancing process inside the currency union is proving deflationary for everyone else. Essentially, as average eurozone wage and price inflation has fallen to extremely low levels, euro crisis countries are forced into debt deflation. Predictably, the wreckage is truly enormous. Policies and consequences are akin to what U.S. President Hoover and German Chancellor Brüning attempted in the 1930s. As we know, this sad experiment in macro policy folly gave the U.S. FDR, the New Deal, and Social Security, while outcomes in Germany were far less benign. It is as yet unclear which path Europe will take this time; the constructive or the destructive one. What drives then Germany’s current policy? Doesn’t its leadership recognize the danger it poses for the future of the eurozone? Confusion, a load full of ideological baggage, and short-sighted vested interests, I suppose. Apparently the German authorities do not understand the futility of their favored policies. My reading is that they have never quite understood that Germany could only succeed with its peculiar economic model in the past because and as long as its key trading partners behaved differently. Today Germany is forcing Europe to become like Germany. The trouble is of course that not everyone can be super-competitive and run perpetual current account surpluses at the same time. Somehow the German authorities are stuck in a deep ideological hole on this issue – and they keep on digging. A new issue of Accounting, Economics and Law has published a series of articles (open access) on Minsky and banking. In addition to my contribution, you can find some nice pieces by Thorvald Moe, Yuri Bondi, and Robert Boyer. According to Minsky, “A capitalist economy can be described by a set of interrelated balance sheets and income statements”. The assets on a balance sheet are either financial or real, held to yield income or to be sold or pledged. The liabilities represent a prior commitment to make payments on demand, on a specified date, or when some contingency occurs. Assets and liabilities are denominated in the money of account, and the excess of the value of assets over the value of liabilities is counted as nominal net worth. All economic units – households, firms, financial institutions, governments – take positions in assets by issuing liabilities, with margins of safety maintained for protection. One margin of safety is the excess of income expected to be generated by ownership of assets over the payment commitments entailed in the liabilities. Another is net worth – for a given expected income stream, the greater the value of assets relative to liabilities, the greater the margin of safety. And still another is the liquidity of the position: if assets can be sold quickly or pledged as collateral in a loan, the margin of safety is bigger. Of course, in the aggregate all financial assets and liabilities net to zero, with only real assets representing aggregate net worth. These three types of margins of safety are individually important, and are complements not substitutes. If the time duration of assets exceeds that of liabilities for any unit, then positions must be continually refinanced. This requires “the normal functioning of various markets, including dependable fall-back markets in case the usual refinancing channels break down or become ‘too’ expensive”. If disruption occurs, economic units that require continual access to refinancing will try to “make position” by “selling out position” – selling assets to meet cash commitments. Since financial assets and liabilities net to zero, the dynamic of a generalized sell-off is to drive asset prices towards zero, what Irving Fisher called a debt deflation process. (To some extent, this can be called a liquidity problem – but it is really more than that. I’ll return to this later.) Specialist financial institutions can try to protect markets by standing ready to purchase or lend against assets, preventing prices from falling. However, they will be overwhelmed by a contagion, thus, will close up shop and refuse to provide finance. For this reason, central bank interventions are required to protect at least some financial institutions by temporarily providing finance through lender of last resort facilities. As the creator of the high-powered money, only the government – central bank plus treasury – can purchase or lend against assets without limit, providing an infinitely elastic supply of high-powered money. One of the main contributions of Modern Money Theory (MMT) has been to explain why monetarily sovereign governments have a very flexible policy space that is unencumbered by hard financial constraints. Through a detailed analysis of the institutions and practices surrounding the fiscal and monetary operations of the treasury and central bank of many nations, MMT has provided institutional and theoretical insights about the inner workings of economies with monetarily sovereign and nonsovereign governments. MMT has also provided policy insights with respect to financial stability, price stability, and full employment. As one may expect, several authors have been quite critical of MMT. Critiques of MMT can be grouped into five categories: views about the origins of money and the role of taxes in the acceptance of government currency, views about fiscal policy, views about monetary policy, the relevance of MMT conclusions for developing economies, and the validity of the policy recommendations of MMT. This paper addresses the critiques raised using the circuit approach and national accounting identities, and by progressively adding additional economic sectors. MMT is agnostic regarding the fiscal position of a monetarily sovereign government per se. As Abba Lerner’s “functional finance” approach insists, the fiscal position of the government is not a relevant policy objective for a monetarily-sovereign government. Price stability, financial stability, moderate growth of living standards, and full employment are the relevant macroeconomic objectives, and the fiscal position of the government has to be judged relative to these goals instead of for itself. If there is inflation that is demand-led, the fiscal position is too loose (surplus is too small or deficit is too large); if there is non-frictional unemployment, the fiscal position is too stringent. Also, if financial fragility grows due to negative net saving by the domestic private sector, the government’s stance is probably too tight.